Shar Music targeted personalized offers based on past order history, preferred product category and towards top customers. Using this targeted communication, response and conversion rates increased. 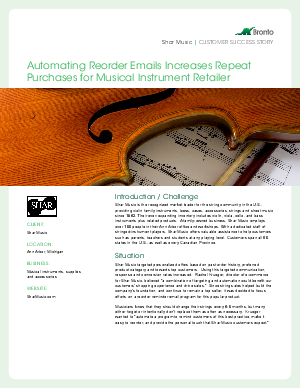 Rachel Krueger, director of e-commerce for Shar Music, believed “a combination of targeting and automation could benefit our customers’ shopping experience and drive sales.” Since string sales helped build the company’s foundation, and continue to remain a top seller, it was decided to focus efforts on a reorder reminder email program for this popular product.